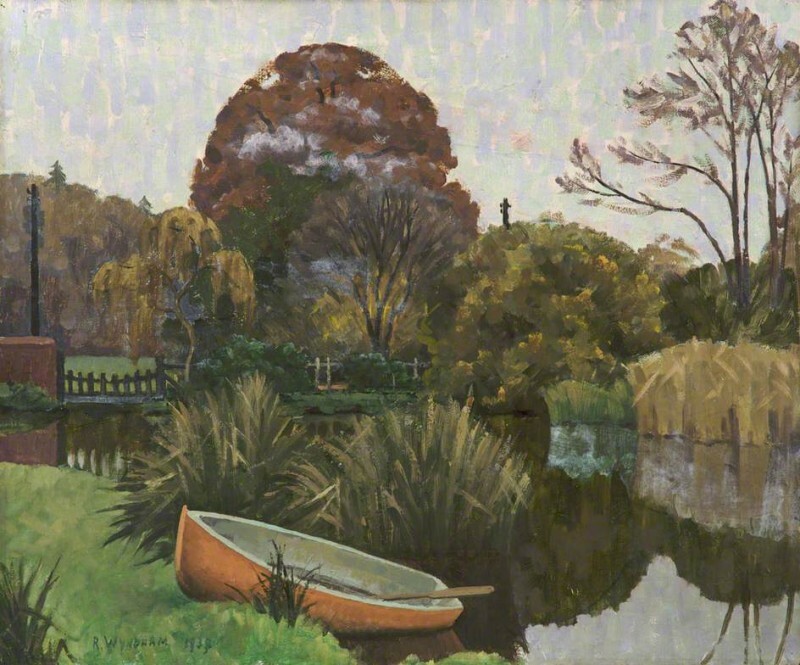 Martin Hopkinson asked whether Richard Wyndham’s painting shows the River Medway on the north side of Tonbridge. Hopkinson compared 'The Pink Boat' to Wyndham’s 1936 painting called ‘The Medway near Tonbridge’ and another of his works ‘Still Waters’. Grant Waters began the discussion by pointing out that after Wyndham left London he moved to Tickerage Mill in East Sussex, spending much time there in the 1930s. Waters noted that the mill has an extensive lake fed by streams of the River Uck, and said, while he could not be certain, it is more likely that The Pink Boat shows a view of Tickerage than a scene of the River Medway. Cliff Thornton agreed with Grant Waters, noting that the artist recorded the fencing and telegraph poles (still visible on Google Earth). Pictures of this view were added by Osmund Bullock. While it can be seen, comparing The Pink Boat to pictures of Tickerage Mill today, that the painting is set in the area, we also see that Wyndham simplified many aspects of the surroundings. With the Art Detective's extensive evidence, the location of Trickerage Mill, East Sussex has been added to Art UK's records. Does Richard Wyndham's 'The Pink Boat' show the River Medway near Tonbridge?